Elke the Ripper or Master of the Scythe. [FAQ] No, I don’t lost a bet. We don’t have a lawn-mower by choice. Yes, we tried the alternatives including a reel lawn-mower. Yes, I really enjoy doing this. It is utterly exhausting – there is no other outdoor activity in summer that leaves me with the feeling of really having achieved something! So I was curious if Grim Reaper the Physicist can express this level of exhaustion in numbers. Just holding a scythe with arms stretched out would not count as ‘work’. Yet I believe that in this case it is the acceleration required to bring the scythe to proper speed that matters; so I will focus on work in terms of physics. In order to keep this simple, I assume that the weight of the scythe is a few kilos (say: 5kg) concentrated at the end of a weightless pole of 1,5m length. All the kinetic energy is concentrated in this ‘point mass’. But how fast does a blade need to move in order to cut grass? Or from experience: How fast do I move the scythe? One sweep with the scythe takes a fraction of second – probably 0,5s. The blade traverses an arc of about 2m. However, using this speed in further calculations does not make much sense: The scythe has two handles that allow for exerting a torque – the energy goes into acceleration of the scythe. If an object with mass m is accelerated from a velocity of zero to a peak velocity vmax the kinetic energy acquired is calculated from the maximum velocity: m vmax2 / 2. How exactly the velocity has changed with time does not matter – this is just conservation of energy. But what is the peak velocity? For comparison: How fast do lawn-mower blades spin? This page says: at 3600 revolutions per minute when not under load, dropping to about 3000 when under load. How fast would I have to move the scythe to achieve the same? Velocity of a rotating body is angular velocity times radius. Angular velocity is 2Pi – a full circle – times the frequency, that is revolutions per time. The radius is the length of the pole that I use as a simplified model. I am assuming that this energy is just consumed (dissipated) to cut the grass; the grass brings the scythe to halt, and it is decelerated to 0m/s again. That sounds way too much already: Googling typical energy consumptions for various activities I learn that easy work in the garden needs about 100-150kcal kilocalories per half an hour! If scything were that ‘efficient’ I would put into practice what we always joke about: Offer outdoor management trainings to stressed out IT managers who want to connect with their true selves again through hard work and/or work-out most efficiently. So they would pay us for the option to scythe our grass. scythe…1s…scythe…1s…scythe…1s….scythe…1s….scythe…longer break, gasping for air, sharpen the scythe. I assume a break of 9,5s on average to make the calculation simpler. So this is 1 arc swept per 10 seconds, 6 arcs per minute, and 180 per half an hour. After half on hour I need to take longer break. … about five times the daily energy demands of a human being! Velocity enters the equation quadratically. 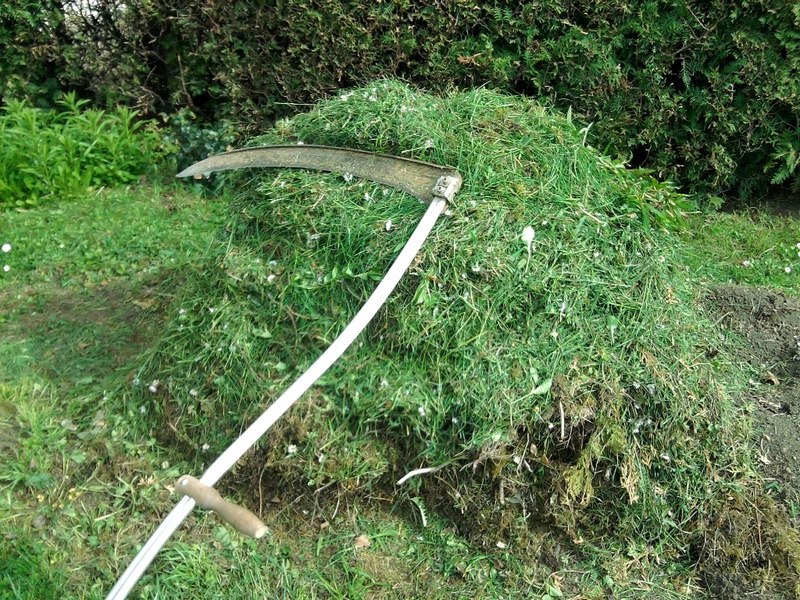 Assuming now that my peak scything speed is really only a tenth of the speed of a lawn-mower, 47m/2, which is still about 10 times my average speed calculated the beginning, this would result in one hundredth the energy. So my assumed scythe’s acceleration is about 10 times a Ferrari’s! Now I would need a high-speed camera, determine speed exactly and find a way to calculate actual energy needed for cutting. This was just playful guesswork but the general line of reasoning and cross-checking orders of magnitude outlined here is not much different from when I try to get my simulations of our heat pump system right – based on unknown parameters, such as the effect of radiation, the heat conduction of ground, and the impact of convection in the water tank. The art is not so much in gettting numbers exactly right but in determining which parameters matter at all and how sensitive the solution is to a variation of those. In this case it would be crucial to determine peak speed more exactly. In physics you can say the same thing in different ways – choosing one way over the other can make the problem less complex. As in this case, using total energy is often easier than trying to figure out the evolution of forces or torques with time. The two images above were taken in early spring – when the ‘lawn’ / meadow was actually still growing significantly. Since we do not water it, the relentless Pannonian sun already started to turn it into a mixture of green and brown patches. This is how the lawn looks now, one week after latest scything. This is not intended to be beautiful – I wanted to add a realistic picture as I had been asked about the ‘quality’ compared to a lawn-mower. Result: Good enough for me! This entry was posted in Physics, punktwissen, Science and Technology and tagged Classical Mechanics, Energy, Garden, Modeling, Physics in a Nutshell, Physics in Everyday Life, Science, Scythe by elkement. Bookmark the permalink. I’ve read about homesteaders cutting the grain and hay with scythes, and that a tremendous amount of food needed to be prepared for the harvest crews. This was high calorie consumption, lots of fats with butter, cream, gravies… heavily sweetened jams and glazes, and honey, lots of breads, pastries (usually pies, with lard-based crusts and high-calorie fillings made with nutrient rich fruits or custards made from eggs) and cakes. The women were up early baking and butchering animals for meat. And the farm gardens were huge, just to keep up with feeding everyone through their summer labours. Most large farms had summer ovens outside the house that ran all day. Thanks, Michelle – that’s very interesting … and admirable! I can imagine how relieved people must have been once fossil fuels have been made available as a “replacement”. This is maybe comparable to the replacement of horses by cars – I have been told that this has been done because at that time the fuel was cheaper than feeding the animals! I wonder how much more food was available to sell off the farm once machinery took over the hard work of farming, and both animals and humans consumed less? Interesting set of questions! Absolutely – I should try to read about the history of farming in my place (I am in need of ideas for “summer reading” anyway). I have visited an open-air museum some years ago – farm houses turned museums, and exhibitions of all kinds of ancient devices. I was most impressed by the way people conserved food (and kepts animals like mice off! ), and were content with so little personal space. And many houses of poorer farmers did not have chimneys – I think a specialty in Easter Austria. They had the smoke float along the ceiling and evade through a small “windows” in the room (called “smoke kitchen” in German). The smell in these rooms turned museum was still very strong although the thick layer of black precipitate covering the ceiling had been removed. I wonder if new inventions could come from revisiting old technologies and imagining them in different ways than what they were or what they led to in the past? I also enjoy visiting sites with historical content. It certainly puts an end to any potential nostalgia one might have for a poetic past, but it also gives me a sense that hand tools generated a wide latitude for individual adaptation and innovation. Back when we had goats, we (my dad and I) used to reap the loawn, because the goats won’t eat the short cut from the mower. The main factors in that work were technique and sharpness of the scythe. Moisture and grass type were also of importance. Longer and rigid grasses tend to fal to the scythe easier than the short, fluffy types. Moist grass is heavier, and dulls the blade more quickly. Holding the shoulders rigid while roatating from the hips speeds the work up considerably, because the arms don’t exhaust as quickly, and the scythe also moves quicker. The best results are achieved, however, if the shoulders move in synchrony with the hip and back, vastly increasing arc size, and thus, blade velocity. The movment of the blade depends next to nothing on the residtance of the grass, but on the limited mobility of the human body, if the scythe is properly sharpened. I recon an experienced reaper would consider this work medium garden work, sort of like light jogging, spending about 200-250 kcal per half hour. Three hours of reaping would make for a good workout, accordingly. I think what might not be helpful is that I try to cut the ‘grass’ as short as possible despite the ground is rather bumpy. This limits the usable arc even more, and the scythe is definitely sometimes stopped due to resistance – not by grass but rather by dense grass sods that stick out by a few centimeters … as the whole ‘planting’ is very inhomogeneous. I also find the (still rather short) grass most difficult to cut, in contrast to all the weed. You live in a farming area, correct? Some of the older farmers might give you some reaping advice. That’s what we did back then. If you want to cut the grass short, you might want to consider using a sickle. You are clearly a Zen Master with the scythe. I have always seen them for sale in a ‘nonelectric’ catalog we get but was concerned that we just had too much ground to cover. We had also considered reel-mowers but, again, too much ground to cover. This post had made me feel guilty for the gasoline-powered mowers I use to keep the lawns under control and the diesel-powered tractors I use to keep the pastures managed. I don’t know how folks managed in the ‘old’ days … taking down acres upon acres with hand tools such as you describe. People were certainly made of different ‘stuff’ back then! You are a ‘throwback’ Elke! If everyone used a scythe the world might be a better place! Both you and Maurice are correct in that a boost (resulting from work of moving the scythe) above basal metabolic rate must be part of your calculation. Basal Metabolic Rate (BMR) can range from 1027 kcal/d (4301 kJ/day) to 2499 kcal/d (10455 kJ/day), with a mean of 1500 kcal/day (6279 kJ/day). The particular numbers will be, of course, elevated under load, will differ between males and females, and will also be influenced by BMI. The work of scything would certainly push all of these values quite high … and outputs would oscillate in a pattern you described above. Overall, a really complex calculation. D PS: I enjoyed this post quite well and liked the blend of physics, math, and mechanics. Thanks, Dave! You really don’t have to feel guilty – I don’t have much ground to cover. The area to be scythed is something like 250m2 only. But probably scything gets fashionable again – as it happened to other ancient occupations? For example, when I was a child ‘hiking’ was the most boring thing to do in your spare-time, for the grandparents’ generation only. Today, in shops the related departments selling equipment are titled ‘outdoor’, ‘adventure’, ‘trekking’ and whatnot., and I read all kinds of articles by people re-discovering the health and psychological benefits of … simply walking in nature – as if that were news!! So I should probably really figure the numbers out to market scything better – I guess I need an interdisciplinary research project involving medical doctors, and maybe also Zen masters. Fascinating! I like how you switched away from trying to do it based on swinging the blade to comparing it the lawnmower. I would add one energy element to this, though. Agreed, of course, that holding the blade vertically against gravity results in no work as there is no (well, not much) motion in the direction of the force. That said, though, there is still a considerable energy transfer as the muscles in your arm remain tightened, even if you do not move. I think that if this were done as a “how many Kal’s I burned doing this exercise” calculation you would also need to factor in your own motion. Aside from the effort energy, which you already calculated, there’s also the energy associated with the overall body movement. I would assume that the movement could be compared to an equivalent time of doing Tai Chi and would add that in too. On a related note that’s one impressive job you’ve done. I used to mow the grounds behind my house when I was much younger and I recall vividly two things: (1) being exhausted when it was done and (2) not having nearly so neat and tidy a job as you did. I agree – I fully neglected the true work in terms of fuel (ATP/ADP something if I recall correctly) by the muscles). Richard Feynman has some explanation on why just holding an object with arm stretched out requires energy in one of his physics lectures. But as my crude lawn-mower inspired numbers were so high anyway I went for a really simply calculation. Tai Chi – haha! I like that comparison! As I said in the post we joke about the mind-altering Zen-like experience and how that could be sold as fancy outdoor training with an Eastern philosophy touch. Thanks – it looked tidier last week. 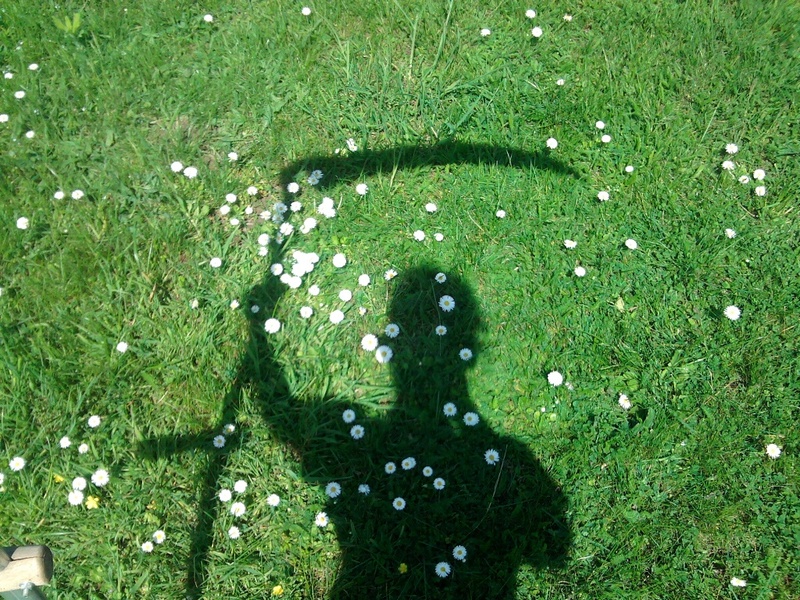 Probably one of the reasons I find it so exhausting is that I really try to cut the ‘grass’ down to small heights – and much energy goes into keeping the scythe’s blade parallel to the ground just a few centimeters above it.